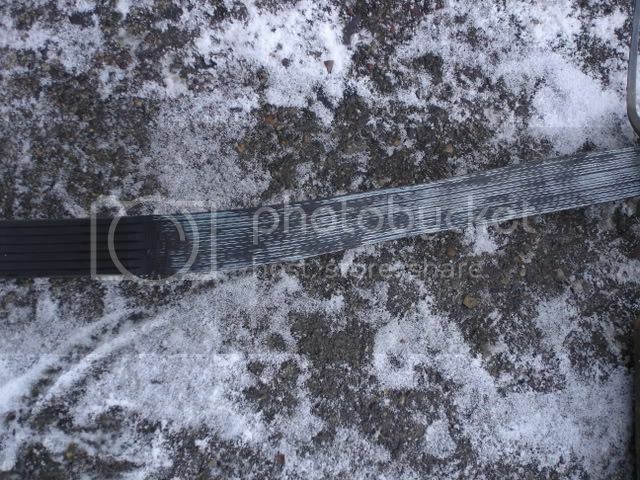 Thread: Heavy 10 serpentine belt?? I would love to hear of a serpentine conversion. My 10L slips all over the place. New belt didn't really help either. "looks like one could be used if the headstock is removed." You don't need to remove the headstock. Wait, back up a bit there. I'am doing mine this week with a 7 rib and permatex glue for all plastics. i'll let you know how it works out. Great work Tony! How did you grind the belt down. Do you have a special jig? Just noticed your high speed pulley. Did it get chewed up by a bad belt? 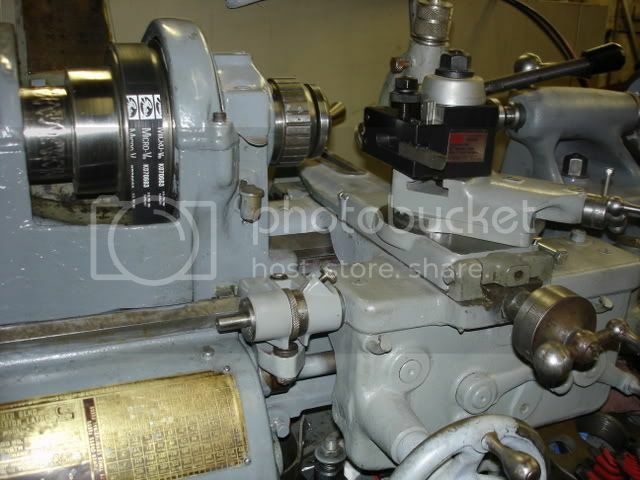 Isn't that pulley something, I got the lathe this summer from a machinery dealer in milwaukee loaded with tooling, turrets, collets etc. for 800 buck's. it was owned by Massy-Ferguson and the only thing I can figure it some one with a wise idea thought that grooving the pulley would give it more bite, dont think he was the sharpest tool in the shed! I think he took out about 35% of the surface area as a result, I have another pulley but havent had time to pull the head stock all the way down yet. just got done machining some 304 stainless all day on the lathe and the belt worked perfect, nothing coming apart the only slip was from my twin v belts on the motor when I got carried away on a cut, I think that was protection from natural selection trying to work [img]smile.gif[/img] this really is a 150% improvement over the leather belt and doesn't even need very much tension to work. I just used my bench grinder to get to the renforcement area, we have every tool you could want and that just plain worked the best. it does take all the frustration out of using the lathe!. thanks for the info Paula, I just did this one quickly as a experiment and it's working out way better than I could have ever expected. I figured the glue would let loose but is working great....so far. I have the v groove pulleys on my nine a home and think this works even better, runs smoother. now I can get back to the metric threads again. I just redid my apron and complete cross slide yesterday, found a new ball bearing big dial cross slide screw for 65.00 buy it now on ebay there was two and lucky for me I got the second one, didn't hesitate on that one. wow what difference. Yep it is. It helps to explain the series of "X's" someone carved into my pulley same location. I've got to try that belt idea! pulley, or the flat part towards the pulley? And why, for whichever it is? a bit of taper on the very ends. Correct? is going to be the victim of some experimentation! 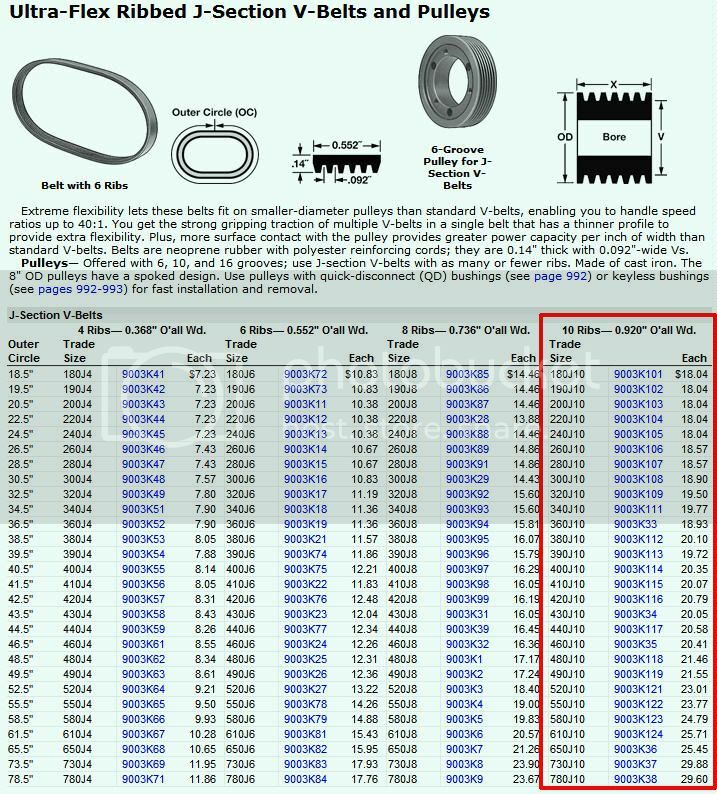 In the McMaster-carr chart above, Paula, how is belt length determined? Is the "outer circle" specification the circumference so for a 58" belt one listed as 58.5" or bigger for the new joint the right one to get? I do like ordering from M-C, but don't like having to return stuff and usually won't resulting in piles of wrong pieces that sit in mute testimony to my stupidity. Ken, I don't like returning stuff either, but I will do it occasionally. M-C is excellent about returns, though I don't like to abuse the privelege, as I'm sure some do. Just to add a little here. Yesterday I got the "NBR Rubber heavy duty flat belt from McMaster-Carr 18 ribs and 1-1/4 wide. I will try to get it on my lathe today or tomorrow and let everyone how it works. I have loked at all the posts on here concerning flat belt. Just thought I would give this belt a try. just a quick note, wear glove's! this is messy, also I went through two tubes of glue and activator,make shure the first part is dead straight, have two people . I figured out my length of overlap and then had the belt over all the way to the left on the pulley mounting shaft so I had some room to work with on top. cover both ends with the activator while it is off the lathe. I wouldn't try doing the glue more than a couple of inches at a time, it's dry in 10 seconds anyhow that way you have trouble with air pockets. there isn't enough time to clamp you just have to use your fingers and again wear gloves...really!. yesterday was day three of full use and still looks great, I think the lap joint on the reinforcement area is working great due to the two different surfaces. I dont think the glue would have held as well on just the rubber, but I could be wrong (and useally I'am) but you never know. the only thing I would do differently now is add just a little more scarf to ease the transision areas a little more. good luck to everyone trying this, it has worked better than we could have ever hoped for and has really made the lathe 100% perfect to use. I really would like to hear how it's working for other's and any changes you made. did you use for that? bonding cement from permatex you mentioned. of belt, so a test will be in order. then the 10L would be next.